Theatre Is Easy | Reviews | Blankland! Ilana Stuelpner and Jon Burklund in Blankland! Photo by Walter Wlodarczyk. BOTTOM LINE: Gleefully deranged and unapologetically messy, Blankland! is the children’s show of your nightmares. Ever notice how children’s TV shows can be sort of…disturbing? Watching kids’ programs as an adult, you might find their forced merriment a little sinister, or uncover some dark inside jokes beneath the songs and silliness they present. Boom Bat Gesture Performance Group embraces, and celebrates, this discomfort with Blankland!, an interactive “children’s show” reveling in all things strange and eerie. Set in Vital Joint’s tiny basement, Blankland! greets its fifteen-member audiences with the atmospheric creepiness of a low-budget haunted house; we half expect something to ambush us from behind the set’s wall-to-wall plastic tarps. Raffi music pipes from the speakers as performer Edward Rice, dressed in a deer onesie, passes out pudding cups and cheerfully warns us of impending gunshots and blood-splatter. Neon-green and spiked with garlic, these pre-show snacks form an apt metaphor for Blankland! itself, their sugary medium couching a vague-but-sharp (and oddly appealing) dissonance. As mounted TV sets broadcast Blankland!’s animated opening theme, maniacally chipper hosts Stab (Ilana Stuelpner) and Blank (Jon Burklund), and their brooding friend Nino (Niko Tsocanos) welcome us into their twisted world. In these roles, and as the woodland creatures, singing pirates, and deranged senior citizens which populate Blankland!, the members of Boom Bat Gesture lead us through a variety hour of skits, songs, and cartoons. Modeled after children’s show vignettes, these sketches are anything but innocent, each scene making either allusion or direct reference to death, violence, and psychological torment. As a hyper-caffeinated trio of “Pippy Butts,” the ensemble’s giggling and tumbling culminates in a gun massacre. The “Evergreen” sequence, in which strobe lights flash as unseen specters progressively bathe a terrified Stuelpner and Burkland in stage blood, seems ripped from a horror film. The introduction of “our friend Head,” a box painted to resemble a disembodied head, gets especially grim: a song pondering the ways the company can play with their quadriplegic friend quickly reveals the hopelessness of Head’s condition and ends with a death-by-stabbing mercy killing. Despite its macabre subject matter, Blankland! is actually very funny, the show’s sheer absurdity and performers’ childlike zeal encouraging us to laugh at what we witness. A song by grungy sea captain Old Damn Boat Man (Tsocanos) encapsulates the show’s message: “When life gets spooky, get kooky!”—that is, disarm fear by becoming even weirder and more outlandish than the things that scare you. 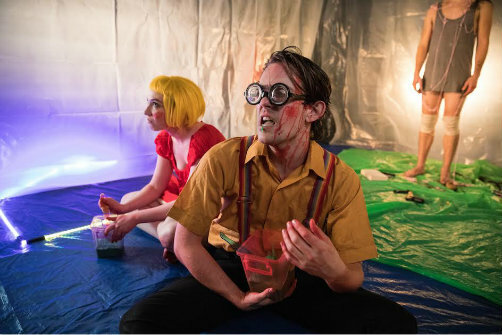 This in-your-face approach is undeniably infectious: we find ourselves cheering on Stab and Blank’s creative attempts to kill Nino, or delighting in the fun of getting sprayed with fake blood, pudding, and silly string (tarps are provided). Blankland! even holds room for moments of subtlety and beauty: there’s striking grace in Tsocanos’ convulsive dancing, and Stuelpner’s ending monologue lends poetry to an old woman’s non-sequitur final ramblings. Like absurdist theatre, slasher flicks, or savory pudding, Blankland!’s pitch-black comedy is an acquired taste, and some may find its style jarring or inaccessibly odd. But for fans of the grotesque, it’s good, messy fun, its peculiarities couching deeper insights about our relationship to fear and ability to mock the inevitable. As children’s shows often end with a moral, Blankland!’s isn’t a bad one to get behind: if life’s nonsensical and death’s unavoidable, we may as well laugh at it all. Blankland! is created by Boom Bat Gesture Performance Group. It is written and directed by Jon Burklund, Ilana Stuelpner, and Niko Tsocanos. Presented by The Exponential Festival and Vital Joint. Sound Design by Anastasia Clarke & Jon Burklund. Lighting Design by Niko Tsocanos. Video Design by Jon Burklund. Head Box Art by DC Stuelpner. Animation and Production Stage Management by Bailey Kushinsky. The cast is Jon Burklund, Ilana Stuelpner, Niko Tsocanos, and Edward Rice.